When the pavements in the city are practically melting under the summer sun, Italians head for the closest coast and roast their buns by the seaside during often lengthy summer holidays. While not everyone has the privilege of a month off to go to the beach, there are options accessible to all for a day-trip from most cities in Italy. Downtown dwellers, students and travelers without a car need not despair: while it’s not always easy to reach beaches in Italy by train, some good ones are accessible. The mostly regional trains to beaches are pretty inexpensive, somewhat efficient, and sometimes even air-conditioned. As we’re doling out good news, you’ll also be happy to know that you don’t need to bring much more than a bathing suit and towel if you’re headed to an Italian beach. 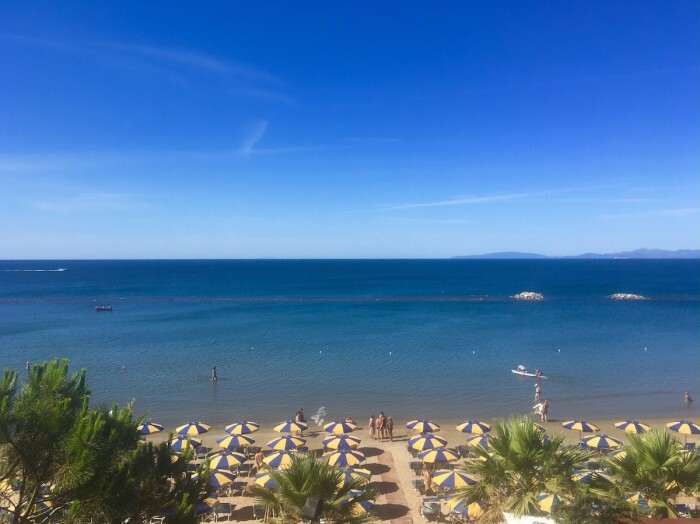 If you’re the type who likes shade and a cool drink, choose a bathing establishment (bagno) with full service – an ombrellone and lettini (beach loungers) are rented by the day and give you access to bathrooms and showers. Hot showers are usually by token. These places have full bars and restaurants as well. Free beaches (spiaggia libera) are free access and free use, but lack bathrooms and showers. People here bring their own umbrellas, tents, picnic tables, powered coolers, radios on carts, balls, bags, dogs… you get the picture. You can show up and just sit on a towel but beware: the sun is strong! So let’s take a look at a few of Italy’s major cities and which beaches you can reach by train from each. Bagnoli is the closest area to the city centre and it is reachable by public transportation (via Linea Cumana EAV or Subway Line No.2 from Piazza Garibaldi to Bagnoli Station) or train from Stazione Centrale in 10-15 minutes. Free beaches are small and packed here, while there are many bagni with great bars, pools and even gazebo areas where you can chill, drink fresh cocktails and feel the “Upper East Siders on vacation at the Hamptons” vibes. In the evening these places become lounge beach bars where you can catch the sunset and enjoy live music followed by a club on the sand. The water is not the best (early this summer it was closed due to an oil leak) but the general atmosphere makes Bagnoli worth it. Arenile and Nabilah are two bagni particularly popular among Neapolitans, but really every place here is perfect if you want to experience a bit of Italian bella vita. The Amalfi Coast is another popular destination for a beach day-trip. It is located about 40 miles from Naples, but there are many buses and trains leaving from Napoli Centrale to get there. 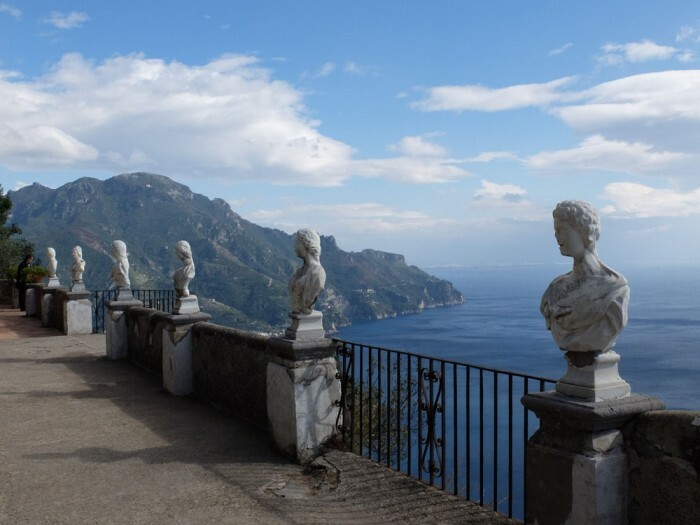 The area stretches from the Gulf of Naples to the Gulf of Salerno and the beaches are enhanced by the gorgeous views of colorful villas as well as the deep blue sea. The bagni (which are also called “lido” here) may be very expensive, but you can go at one of the many spiagge libere and rent beach loungers from the locals for 10-12 euros each. 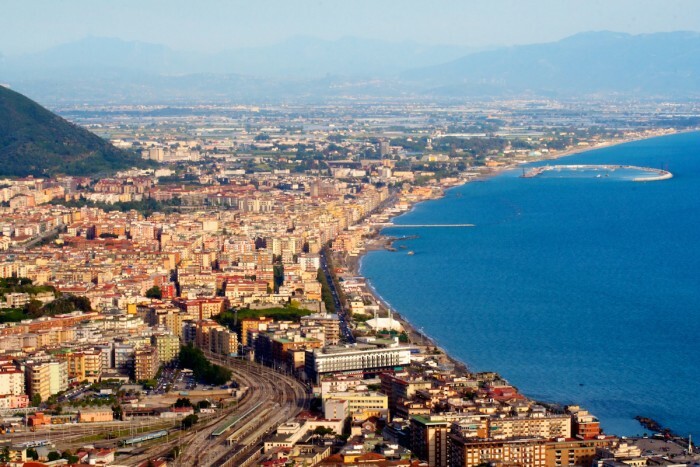 If you are looking for more family-friendly destinations, you can take a Frecciarossa from Naples to Salerno, a small but beautiful coastal town located on the border between Campania and Basilicata. The best part of this area is that every single bagno is fully equipped with bars, restaurants, changing rooms and even playgrounds, so you can drink your mimosa while sunbathing without any guilt. 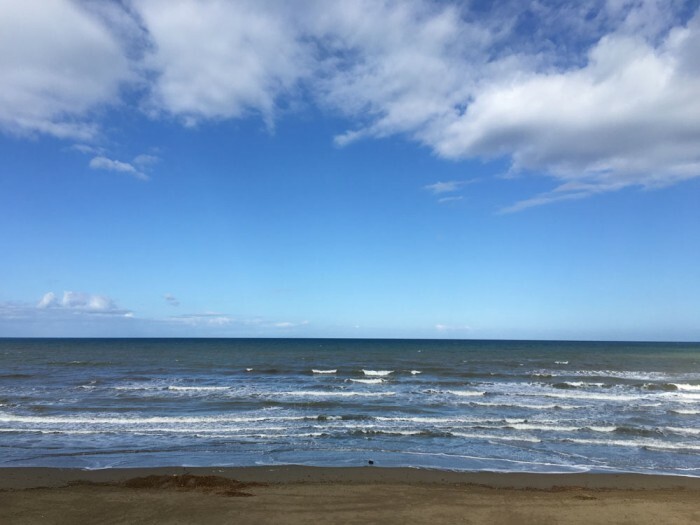 Although Ostia and Fregene are along the coast nearest Rome, there are other nicer places you can easily reach by train for a day-trip at the beach. Sperlonga is a picturesque town south of Rome. 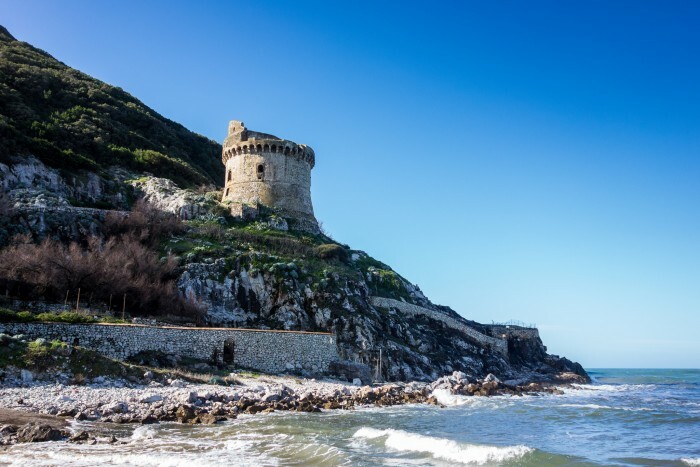 Take the regional train from Roma Termini towards Naples and get off at Fondi-Sperlonga. Once there, you can take a local bus for 1.50 euros or a private taxi (around 20 euros) to reach Sperlonga Mare. The town is divided in two parts; the historical area is closed to the traffic, it is worth a visit if you like hiking and climbing a lot of steps, but the view over the bay is magnificent and you then can totally skip a day at the gym. The other part is along the beach where stabilimenti dominate, leaving only narrow strips of spiaggia libera. If you prefer a family-friendly setting, Le Scissurre is very popular although a bit expensive, especially during weekends. Los Sombreros is a very friendly lido with activities for both children and adults, great cocktails and a restaurant with affordable prices. San Felice Circeo is another town with Blue-Flag rated beaches located nearly 100 km south of Rome and reachable by train (hourly from Laurentina station in Rome, 5-6 euros per person). Although there are many stabilimenti, the free beaches here are extremely beautiful and definitely merit the hot walk to get to them. For those on budget, Sabaudia is to place to be. The spiaggia libera is predominant on the entire coastline while there are some bagni to choose from. Here you can rent a lettino or an umbrella, enjoy street food at one of the many bars located on the lungomare and feel like a local with the mostly Roman clientele. Florence’s Arno river is Instagram-friendly but definitely not suitable for swimming. Luckily, there are plenty of beaches reachable by train from Santa Maria Novella station or by bus. Viareggio is the closest to Florence and you have probably already heard about it for its Carnival. Regional trains leave Florence hourly and cost 9.60 euros per person. Once you arrive, you can take a shuttle bus or walk for one kilometer to reach the coast. Beaches in Viareggio are usually crowded and it is hard to find a free spot but they are also sandy, sunny and well mantained with colorful umbrellas, chairs and lettini (but expensive – around 40 euros per day and up). The water is not the best, especially in August when you may observe various types of seaweed listlessly floating under a coating of slime, but consider it a biology experiment. For something cleaner and sometimes rockier, San Vincenzo is located on the Etruscan Coast of Tuscany, in Maremma. It is reachable by train from Florence with a quick change at Pisa station for 9.40 euros per person. It is know for its crystal clear sea and mostly pebble beaches. Fully equipped bathing establishments alternate with public beaches. Umbrellas and sunbeds can be hired at the nearest “Punto Azzurro” for 7-10 euros where you can also grab street food, drinks and beach supplies at one of the many kiosks along the coastline. Cinque Terre is also a potential day-trip beach destination from Florence, reachable by regional trains. More suitable for hiking than for just lazing at the beach, the area does feature one extensive city-front sandy beach at Monterosso al Mare, and another just beyond at Bonassola. Most of the people who decide to visit Venice do not necessarily want to go to the beach, but if the urge takes you when you see all that water and can’t go in it, it’s useful to know that it can be done… not far away. Jesolo is the closest beach and getting in is quite easy for the most part of the year. You can take a bus from Piazzale Roma in Venice – summer traffic is really heavy, so make sure to bring some fresh water with you – or by train until San Donà di Piave, 25 kms from the beach, where you should be able to get a mini bus. The beach stretches over 13 kms and it has a wide range of reastaurants, hotels and shops on the lungomare. There aren’t many spiagge libere, so be ready to pay for an ombrellone. After a long day of sunbathing spend the evening at Jesolo Paese where you can enjoy un po’ d’aria fresca (fresh air), drink good wines and eat ciccheti, which are the (way better) Venetian version of Spanish tapas. 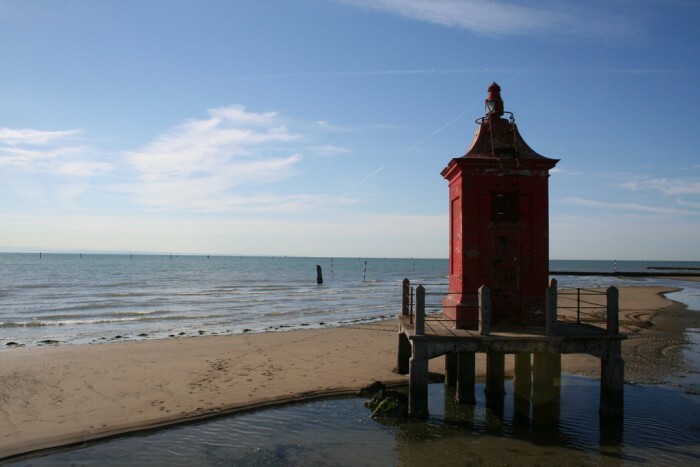 Lignano Sabbiadoro is one hour away from Venice, there are various bus lines that make frequent daily trips. It is well known for its big sandy beaches and for the nightlife that makes it the favourite summer destination for clubbers and locals. During the day you can relax, sunbathe and drink cocktails at one of the many bagni, while at night you can stroll down the lungomare or attend a concert at The Beach Arena that hosts shows and events for the whole summer, both during the day and night. Sometimes called “Little Venice”, Chioggia is a fishing port on the Venetian lagoon and it is reachable both by bus and train (approx 2 hours for 10-15 euros) even though, from April to September, there is a tourist boat that runs between Chioggia and St. Mark’s Square. The sandy beaches are very well organised, alternating spiagge libere and establishments, and prices are more affordable than other places like Lido di Venezia. The historic centre is perfect for an evening stroll while eating a gelato.The Duomo is located at the end of Corso del Popolo, the city’s main street, and it is definitely worth a visit. If you decide to stay overnight, make sure to arrange an early morning visit at the fish market where local restaurants buy seafood. Gloria: Daytrips in Tuscany like a local? With thanks to Vincenzo D’Angelo for the research and insider information in this post.